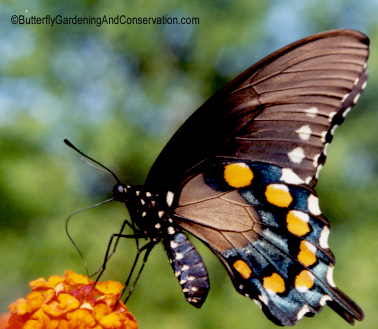 Pipevine Swallowtails have black wings with blue in them with a wingspan of 2.5 - 4 inches. Females have less blue and bigger pale spots on their wings than males. Habitat is mostly brushy or wooded places. Their range includes most of the Eastern US, the southwest and into Mexico. 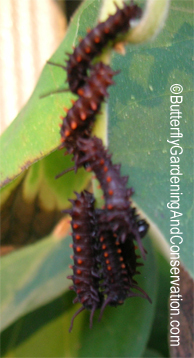 The host plant used by Pipevine Swallowtails are all of the family Aristolochiaceae (pipevine). 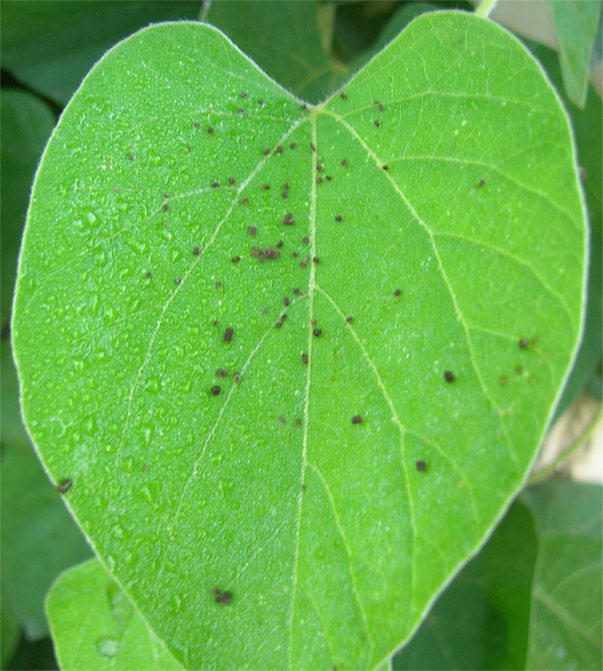 This includes Aristolochia tomentosa, Aristolochia californica, serpentaria, durior, longiflora, reticulata. Aristolochia californica is used by some populations in California. 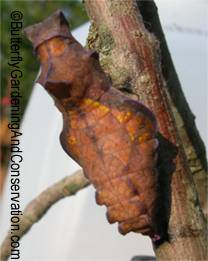 Females will lay eggs on Aristolochia elegans, but caterpillars will die eating it. Aristolochia serpentaria and reticulata are small herbs, the rest are vines. 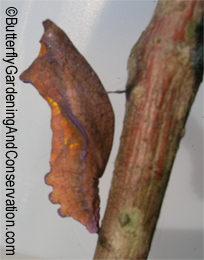 Since Pipevine is poisonous to vertebrates, adult Pipevine butterflies are poisonous to birds and other predators that might try to eat them. 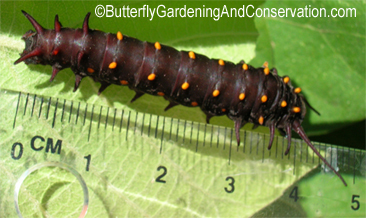 Because of this Pipevine Swallowtails are mimicked by Spicebush Swallowtails (Papilio troilus), female Black Swallowtails (Papilio polyxenes), black form female Tiger Swallowtails (Papilio glaucus), female Speyeria diana and female Limenitis arthemis astyanax. 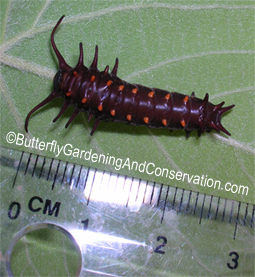 Pipevine Swallowtail eggs are a reddish/maroon color and laid in groups of up to 20 eggs on the underside of host plant leaves. 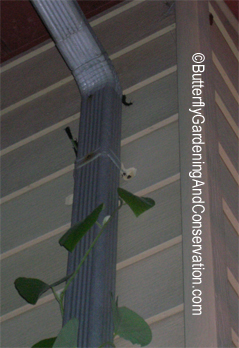 I have yet to see any actual eggs on my pipevine, so I don't have any pictures of them. 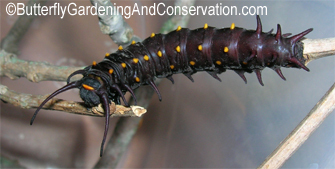 The caterpillars are black with red/orange colored spikes all along their bodies. 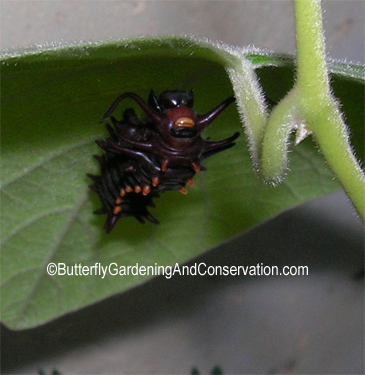 If fact, I had my pipevine for somewhere between 3 and 5 years before I saw any caterpillars on it and I missed the eggs. 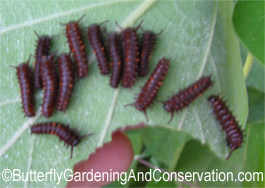 They were also on the underside of a leaf, so they weren't that easy to find. Adults have black wings with blue in them with a wingspan of 2.5 - 4 inches. Females have less blue and bigger pale spots on their wings than males. Their bodies also have some blue on them. 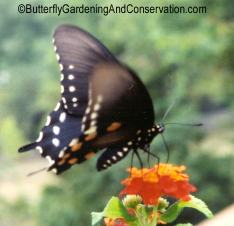 They tend to hover next to flowers when getting nectar rather than landing and resting on the plant. 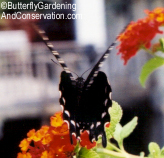 This adult seemed to prefer the red/orange Lantana, shown in picture, and other red flowers over other flowers. These two pictures were the best I could get of adults with their wings open.